Dissidia Final Fantasy Opera Omnia has a wide variety of playable characters in its roster. Each character has their own stats, abilities, and weapons they can equip. The weapons and armor that characters can use are very important because it determines the bonuses their stats get from each piece. Offering boosts to BRV, HP, and other base stats. This guide is going to go through the enhancement process of weapons and armor and why it’s important to do. It’ll also explain what the benefits of enhancement are and the best way to go about it. The first thing to note about enhancement is the natural level of the weapon/armor. Every piece of equipment has its own level. To increase its level you can feed it other pieces of equipment or Power Orbs. Power Orbs are specifically used for leveling your weapons and armor so they’re going to be your best way of enhancing their levels. Every time a weapon/armor gains a level its stats will increase. Just like when leveling a character the process is very similar. The higher the level the more effective the piece of equipment is going to be. But unlike characters, weapons and armor only level up through the enhancement process. Now power orbs are the best way to enhance your weapons but exactly the fastest way. Power orbs are farmable materials you can keep getting over and over again and that’s why they’re so effective. However, they do not give as much experience as 3-star and 4-star weapons/armor. A 4-star power orb gives about 500 EXP, a 3-star equipment gives 600, and a 4-star equipment gives 1200. 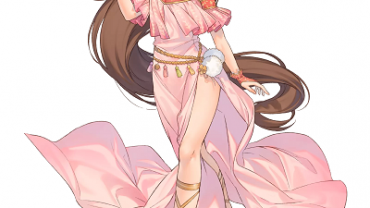 So the rate of experience is actually higher with 4-star weapons and armor and will increase the level of your desired equipment faster. But you’ll also be losing those 4-star pieces of equipment. If you’re going feeding your equipment into another piece that is absolutely fine, there is no loss if you don’t plan on using that piece, to begin with. But there is also a matter of Gil when it comes to your equipment. When it comes to enhancing your equipment there is a drop off between pure experience gain and the overall Gil cost of enhancement. When you enhance a weapon you are getting rid of the materials being used but also paying a cost in Gil in order to do it. So you’re paying a lot for the enhancement of your weapon and you can be losing out on a lot of Gil if you’re just feeding all your high ranking items for enhancement. 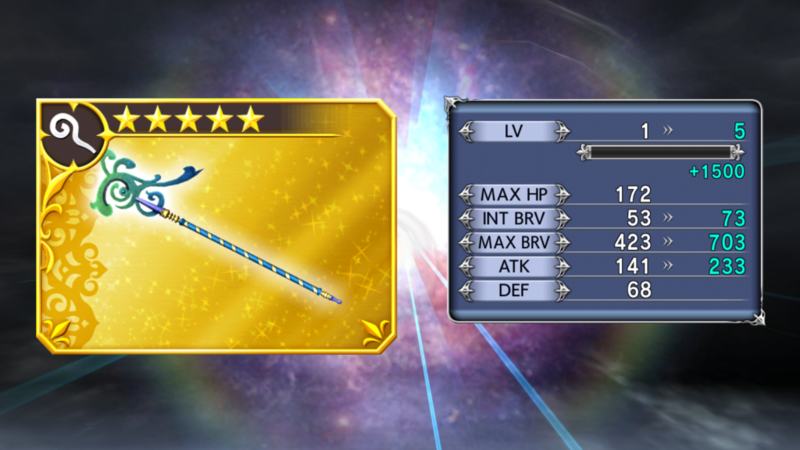 By just using 4-star power orbs you and selling your 3-star and 4-star equipment you are making more Gil than you’re losing while still gaining experience for your gear. 4-star equipment specifically have a higher sell rate when it comes to Gil and you can make a lot off of it for selling them. Feeding high ranking equipment can be seen as a waste depending on the player and it’s really all about what you want to prioritize. If you’re worried about Gil and want to focus on that then definitely only use 4-star Power Orbs and just keep farming those. Sell any 3-star and 4-star equipment you aren’t going to use and you’ll be gaining a hefty income of Gil while still getting your gear enhanced. But in reality, both Gil and Experience are kind of an infinite resource because you can farm both of them endlessly. It’s all a matter of prioritizing your time while playing the game. You can cut time in half for enhancement by just feeding all of your high ranking equipment into your 5-star weapons to level them up quickly. This way all you’ll need to farm for is Gil. Or you can enhance your gear slower by just using power orbs while selling your high ranking gear to get better Gil. This way you’ll just need to farm power orbs. Either way you’re going to be farming it just depends on what you’d rather farm for. Both methods are viable and all depend on the players perspective. Now one more thing we need to talk about is duplicate items. These have a purpose that is really important so do not sell them or feed them to any random item. 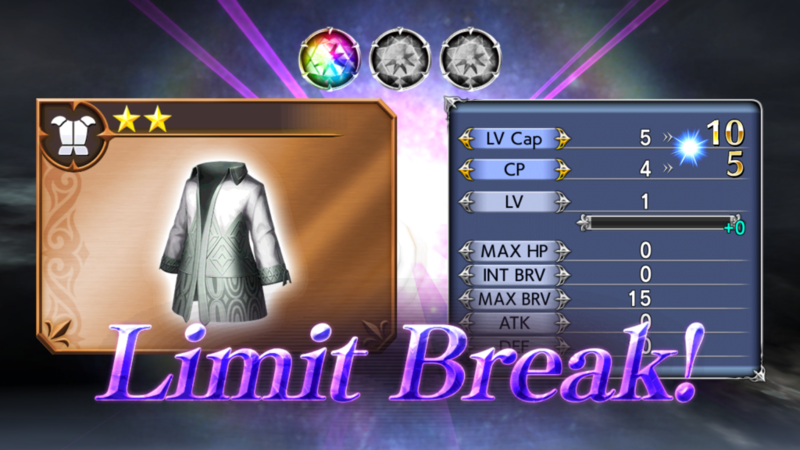 Your equipment in the game has a Limit Break system which makes them far better in the long run. Limit Breaks increase your weapons stats, level cap, and even their CP. 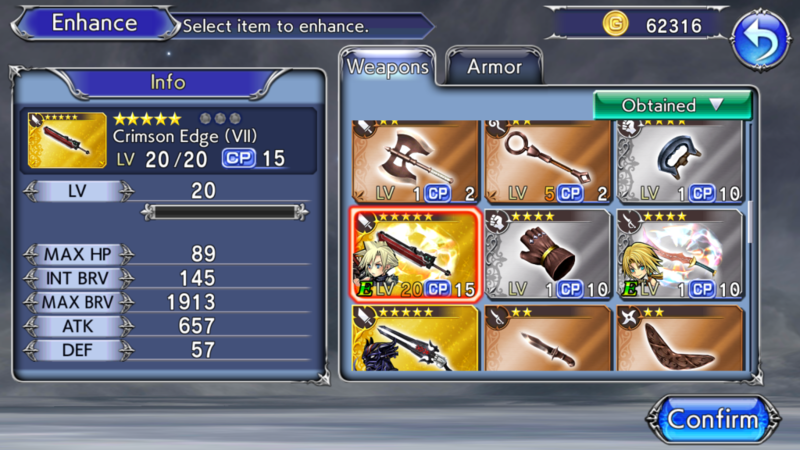 To Limit Break a weapon or piece of armor all you need are two of the same kind of equipment. Two of the same weapon or two of the same armor. You choose one of them to enhance then feed the duplicate into the weapon and you’ll be able to do a Limit Break. You can generally Limit Break a weapon or armor up to 3 times so this gives an enhance level cap, CP, and other advantages 3 times over. 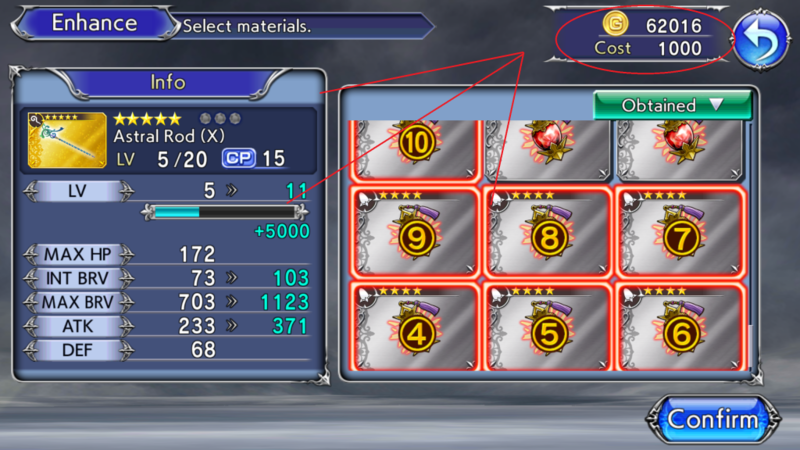 Performing Limit Breaks is important especially for your 5-star weapons and armor. So if you’re lucky enough to pull duplicates of those you should Limit Break them as soon as possible. Thanks a lot! New to the game (about a week) and was precisely the info I was looking for.